1. Do you want to buy a property from one of the most reliable & reputed property builders in Bangalore? 2. Do you want to buy a cozy, beautifully furnished interior 4BHK property? 3. Do you want to live in one of the hottest and happening neighborhoods of Bangalore? If you are a home buyer with above questions in your mind, then, Nitesh estates, one of the prominent names in the real estate venture, founded in 2004 and headquartered in Bangalore has come up with their latest project named 'NITESH LOGOS" near to Ulsoor at Aga Abbas Ali Road, Yellappa Chetty Layout, close to Halasuru Lido Bus Stop. 1. 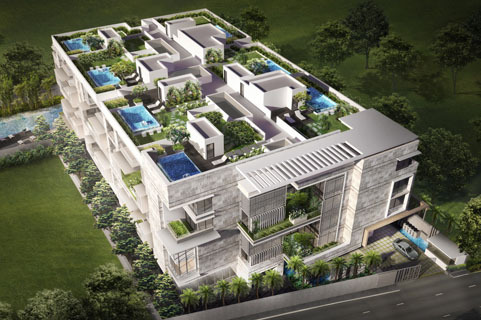 The project is a single building with 16-unit configuration of Luxurious 4 Bedroom Duplex possessions. 3. Designers are from Singapore for Interiors, Landscape and for architecture. 4. With extraordinary finishes, features, dedicated facilities management team and dramatic landscaping providing seclusion, it makes these individually sculpted residences the city’s most desirable place to live. A Wi-Fi Clubhouse & Gymnasium, Swimming pool, Children's play area, Sports Facility, 24 X 7 Security, Landscaped Gardens, Sports Facility, Foosball table, Billiards table, Arrival lobby, Windows unit floor to ceiling windows, Reception Lounge Area, Exotic sky garden. Overall, the residents at Nitesh Logos will enjoy outstanding amenities with privacy and unique design features. Nitesh Logos elevates luxury living to a new level of sophistication in Bangalore. One of the oldest neighborhoods of Bangalore, Ulsoor/Halasuru is strategically located in central Bangalore, which is very close to the eastern terminus of MG Road. The land of Ulsoor is believed to be gifted by the Vijaynagar to the founder of Bangalore, KempeGowda. It got its name from the Kannada word “Halasina Hannu” which means jack fruit dues to jackfruit orchards located next to Ulsoor Lake. The project is located at the easy access from most visited roads which includes MG Road, CMH Road, Cambridge Road and Brigade Road. Ulsoor and Trinity Metro Rail stations too are located here. Bangalore Cantonment railway station is in close vicinity of Ulsoor. There are many educational institutions, schools, hospitals, restaurants etc. too there nearby. For those who want to live closer to the city, but a bit relaxed from the hustle-bustle of the rushing city, Ulsoor is an ideal location to be at. CMH Road is a major shopping destination with many branded fashion outlets and supermarkets. From Ulsoor you can reach to any point of Bangalore within a few minutes the communication system is superb. Also, the residents will have the convenience of luxury hotels like the Oberoi, The Taj Residency, Lifestyle Retail, and other world-class shopping along with some of the finest banks like HSBC Bank, Deutsche Bank, and Citi Bank –all within the vicinity along with a host of restaurants and bars. Bus Stop: Trinity Circle (0.4 km) , Halasuru Lido Bus Stop ( 0.6 km) ,Manipal Center ( 0.6 km) ,Khroad (0.7 km) ,Hasanath College (0.8 km) all are within 1 km. Airport: Bengaluru Internationa Airport is only 37 Kms away to be precise it is (36.9km). 1. Living & Dining: The elegant living and dining area, acts as a central space to unify all entertainment spaces and can be extended by opening up to the outdoor sit-out area. Also, these areas come with Italian marble flooring. 2. Bedroom: Designed with Hardwood flooring this area takes its inspiration from the building’s sophisticated façade. 3. Walk in closet: Those sleek wooden wardrobes with floor to ceiling mirrors and ample storage space, make up a perfect walk in closet. c. Utility: With Imported anti-skid vitrified tiles, utility area comes with ample storage space. 6. Bathroom: Luxury Kohler brand fittings raises this space to a high luxury area with large slabs that create strong focal walls and let the bath stand on its own. It also includes Shower cubicle, bathtub, and basins. 8. Priced at 12.0 crores and above. There are 5 apartments per floor. From a design perspective, the floor plans are "the best" from what we have seen till date. There is an entrance lobby which ensures privacy in the apartment. The living room is of size 14.3 *27.9 which is very spacious with separate dining space of 12.2 * 24.6 which is a BIG positive. The kitchen is of size 12.6 * 13.6 and comes with an additional utility space, the same is very good in terms of size. Also, the views from the kitchen are not blocked which is a huge plus. The bedrooms are very spacious. Overall from a design and finishes perspective, those Designers from Singapore have done a great job in laying out the floor plans. 1. Attention to details, no-compromise quality, and impeccable client service. 2. Luxurious Amenities like Jacuzzi, Sky garden. 3. Architecture & Floor plans. 4. Extraordinary finishes, features, dedicated facilities management team and dramatic landscaping providing seclusion, it makes these individually sculpted residences the city’s most desirable place to live. Constructed in the prime neighborhood with attention to details, no-compromise quality, Nitesh Logos stands out and wins all our heart.